Randolph’s trail system runs a 16-mile course traversing five parks, the Clyde Potts Reservoir Watershed and 2,000 acres of pristine open space. The trails link together schools with neighborhoods and connect to Patriots’ Path at Combs Hollow and Old Brookside. Randolph’s trails should be viewed as a work in progress as we continue to pursue easements and funding to expand our trail network. The township funds 90% of design and construction costs through state grants and developer contributions. To date, over $1.5 million in state grants and developer contributions has been invested in Randolph’s trails. 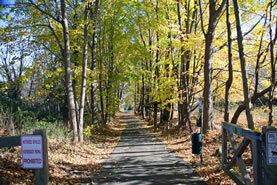 Open year round, the trails can be used from dawn to dusk and are closed at night. During the winter months, there is no snow or ice removal, providing a wonderful opportunity for cross-country skiers and snowshoe enthusiasts. View a map of the Randolph trail system . Prefer hard copy? Printed maps are available at all of the trail heads, at town hall and at the recreation office on Calais Road. Completed in November of 2017, the trails master plan includes an assessment of the current trail conditions, an analysis of trail connectivity, an assessment of opportunities to expand the network by identifying specific trail segments, a maintenance plan, and recommendations for trail marking and branding of the system. Located on Everdale Road, one-quarter mile south of Millbrook Avenue. Parking is available. Located on Millbrook Avenue, opposite Randolph High School. Parking is available in the southern-most parking lot adjacent to Millbrook Avenue. Located on Millbrook Avenue. Parking areas can be found on both sides of Millbrook. Located on Carrell Road. Parking areas can be found in several locations. Located on Doby Road, off of South Road. Parking areas are found at Heistein’s Pond, just below the park, on Doby Road. A small parking area exists at the intersection of Combs Hollow and Doby Road. This is a Patriots’ Path connection. Located approximately one half mile south of Sussex Turnpike on Old Brookside Road. Parking is available. This is a Patriots’ Path connection. Hours: The trails are open from dawn to dusk and are closed after sunset. Dogs must be controlled on a 6-foot leash at all times. Please clean up after your dog. Motor vehicles, ATVs and dirt bikes are absolutely prohibited. Vehicles will be impounded by the police. Possession or consumption of alcoholic beverages is strictly forbidden. Bicyclists should conform with helmet laws, have warning bicycle bells and yield to all pedestrians. Horses are not allowed on the trails. Report violations and safety issues to the Randolph Township Police Department at 973.989.7000. The department patrols the trail system with two specially-outfitted vehicles. Report maintenance and repairs to the Randolph Township Department of Parks & Recreation at 973.989.7081.